AC Milan coach Gennaro Gattuso, 40, who was very controversial during his footballing career looks like he has taken his tough stance into management. The Italian manager was caught on camera playfully slapping youngster Gabriele Bellodi as he walked behind him in the tunnel area earlier this month. 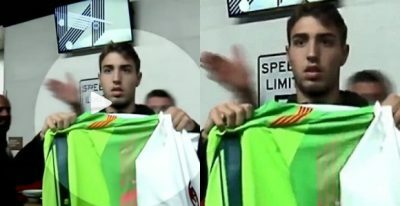 The playful jab occurred as 17-year-old Bellodi was filmed proudly showing off a Barcelona shirt to the camera after the two sides played an International Champions Cup friendly in California.